Samsung Galaxy S9 and Galaxy S9+ were launched in India at an event held in New Delhi on March 6. With the phones available for purchase starting Friday, March 16, Samsung has pushed the latest software update that brings improved stability to the Face Unlock feature on the Galaxy S9 range as well as to the camera on the two phones. Apart from that, the company is also rolling out the latest March Android security patch, dated March 1. 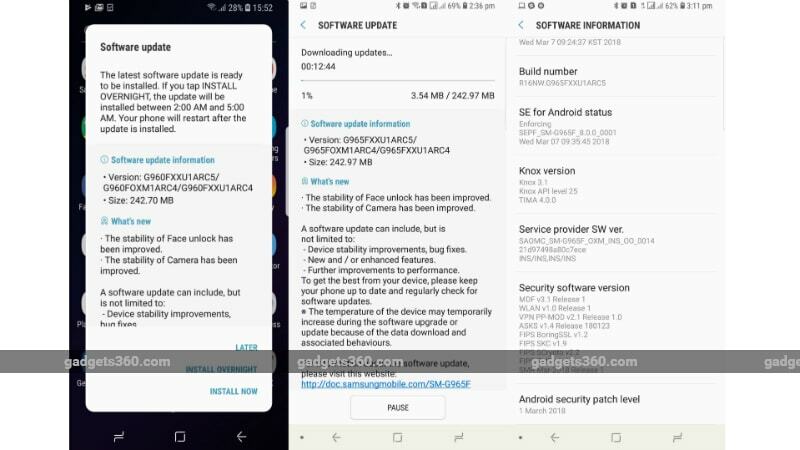 The build number for the update is G960FXXU1ARC5 for the Samsung Galaxy S9 and G965FXXU1ARC5 for the Samsung Galaxy S9+. Size of the update is around 243MB. The usual device stability improvements and bug fixes also accompany the major upgrades with this update. It is now rolling out to units in India. Both smartphones sport almost identical specifications apart from difference in display size, RAM variants, and rear camera. The Galaxy S9 range comes with the latest Qualcomm Snapdragon 845 SoC in US and China and Samsung Exynos 9810 SoC in other markets including India. Apart from that, the phones have 64GB/ 128GB/ 256GB storage variants, Android Oreo out-of-the-box, AR emoji, and dual AKG-powered speakers. The Galaxy S9 sports a 5.8-inch QHD+ Curved Super AMOLED display with an 18.5:9 display, while the Galaxy S9+ gets a 6.2-inch one. The Galaxy S9 has 4GB RAM and the Galaxy S9+ comes with 6GB of RAM. Lastly, the Galaxy S9+ features a dual camera setup on the back, while the Galaxy S9 gets just one; both have the Super Speed Dual Pixel 12-megapixel autofocus image sensor.